Sakai Guides and DocumentationAssessments and Grading AssessmentsHow do I grade assessment submissions by student? Most question types in Tests & Quizzes are automatically graded by the system. However, you will need to manually score short answer/essay questions, file uploads, and audio recordings. You may also adjust the auto-graded scores, add comments, or give partial credit. For more information and additional options for grading assessments, see the following article: How do I grade Tests & Quizzes? Select the Tests & Quizzes tool from the Tool Menu of your site. Select the Published Copies tab. Zoom: Select the Published Copies tab. Click on the Published Copies tab to view the assessments that have been released to students in your site. Go to the assessment submissions. Zoom: Go to the assessment submissions. Select the Scores option from the drop-down menu for the assessment you would like to grade. Alternately, you may also click on the number of student submissions in the Submitted column to view the submissions. By default, the submission that displays for each student will be based on your assessment's Recorded Score setting. For example, if you accept the highest score, the highest scoring submission will display. If you accept the average score, the average point value of all the student's submissions will display. If your assessment allows multiple submissions, or if a student has submitted an allowed retake, you can choose to view all student submissions by selecting All Submissions from the View drop-down menu. Click on the student's name to view the individual submission. View and enter grades/comments for the individual student. 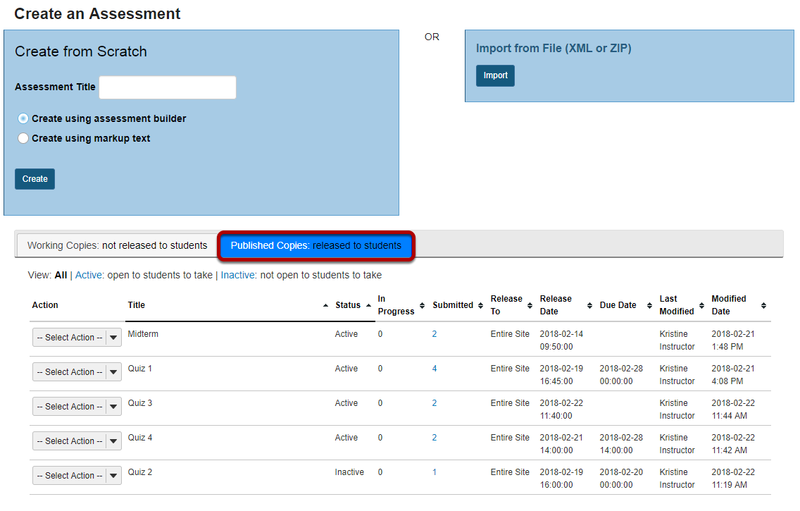 Zoom: View and enter grades/comments for the individual student. The individual student submission will be displayed, showing all of the questions and answers for that student. 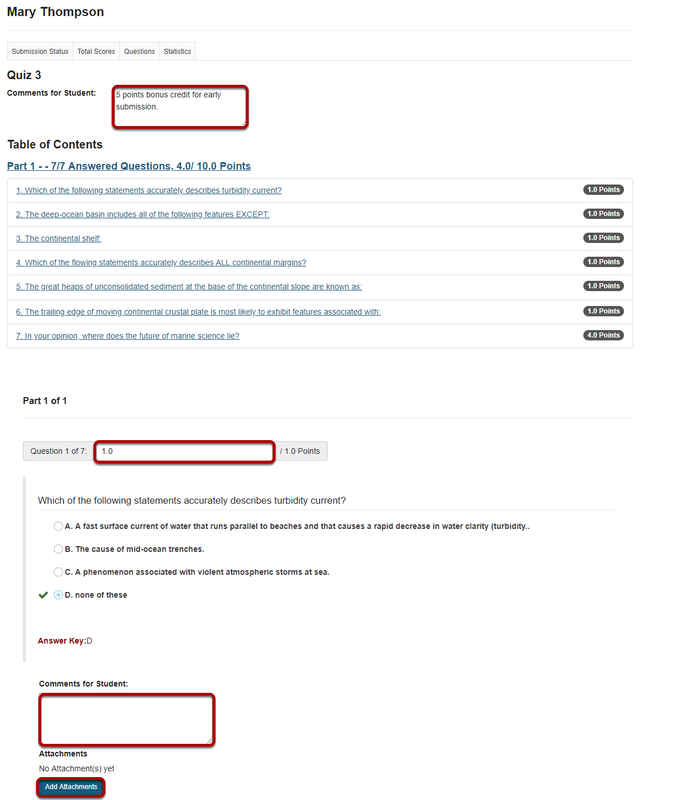 You may enter or modify comments and points for any of the questions in the assessments as needed. You may also add attachments to provide additional feedback for a particular question if desired. Be sure to scroll down to the bottom and click Update to save your changes! Prev: How do I grade Tests & Quizzes? Next: How do I grade assessment submissions by question?